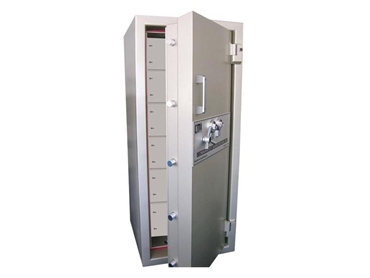 The CMI Commander Bankers safes available from Safes Galore are designed to resist all known forms of attack. The safe body and door provide a monolithic barrier for resisting thermic attack, explosives, drills and cutting tools. The CR10-B safe has been designed to be fire resistant for one hour. The 38mm full throw bolt work secures the safe at 14 points, all activated by a 32mm cam throw mechanism with multiple glass activated dead locking devices.